Where has the October gone?! I must admit that we did not find a moment to take a family photo this month so this one is one of my favourite photos from our trip to see my family in the USA in September. 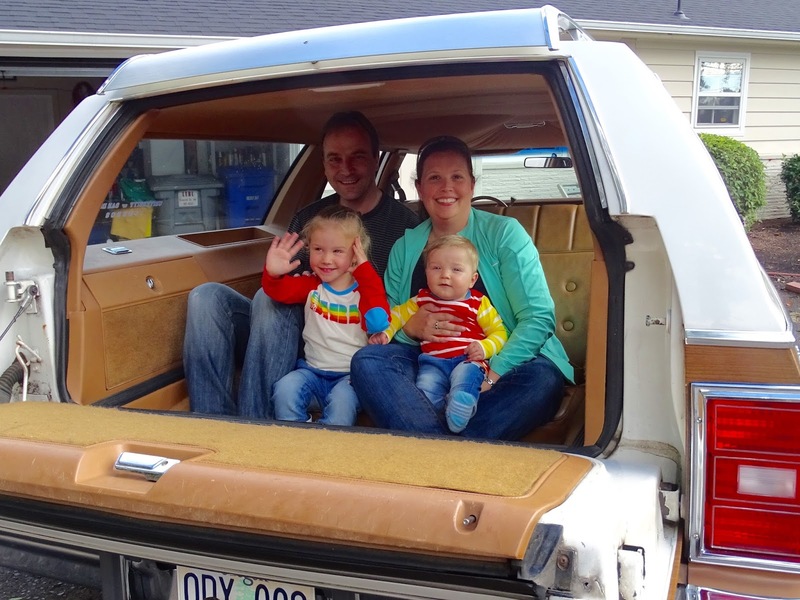 My mother and father bought this Chevrolet Station Waggon when I was 2 years old and so it is easy to say I have many happy memories in this car. It is family tradition when we visit my parents to take a photo in it. 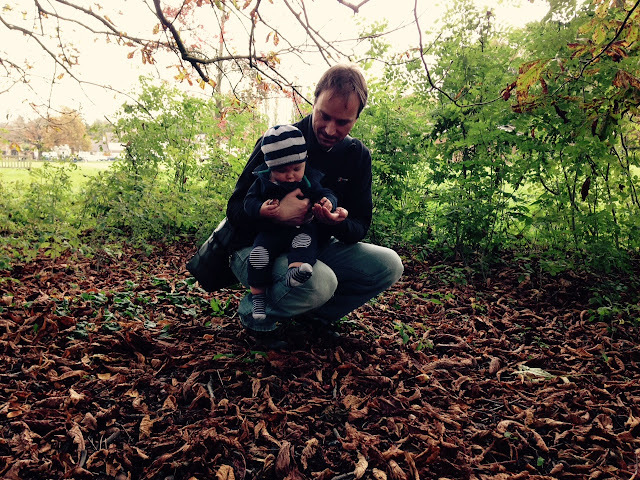 October was a fun month as we took the time to enjoy the changing weather. I personally love sunny but cooler Autumn days. 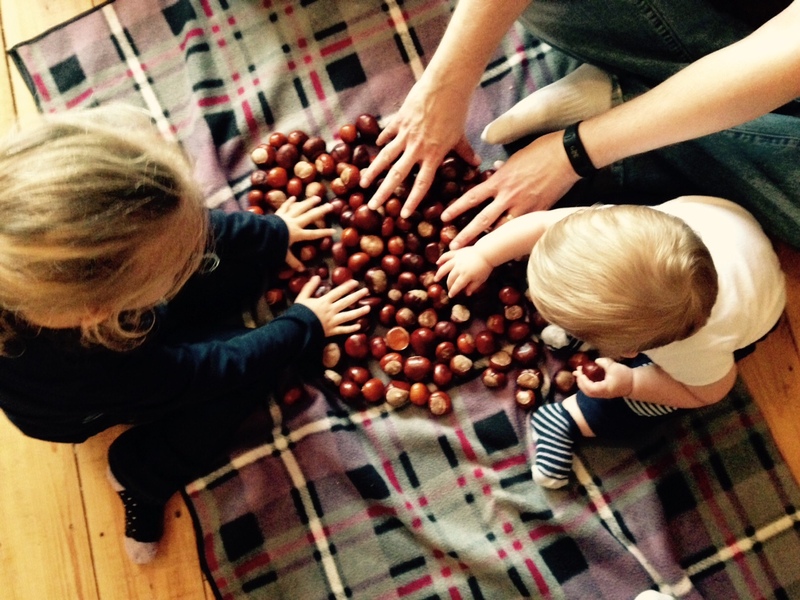 Little LadyBug (LL) has loved collecting conkers and watching the leaves change colours. She loves discussing the days of the week, what month it is and also the weather. We had fun exploring an "Autumn Festival" and went on a hunt to find that "perfect" conker. Bumblebee Boy (BB) loved when we went to the grocery store on ordinary Saturday and he got to sit in the shopping cart for the first time next to his Big Sister. He loved sitting next her and watching the world around him. He is also loves standing at the coffee table now so he can play with new toys and steal food off his sister's plate. He is probably only a couple weeks of trying to walk. We have spent time this month doing Halloween crafting. 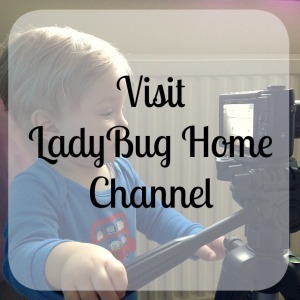 We filmed a "Carving a Pumpkin with LadyBug Home" for my YouTube Channel. 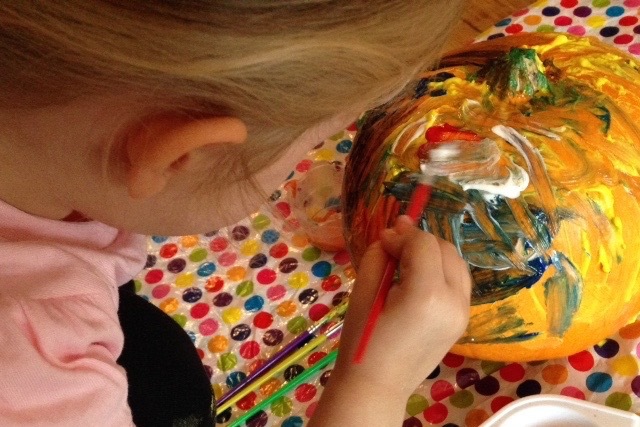 We painted a pumpkin and covered it in glitter. I have managed some lazy afternoon snuggles. 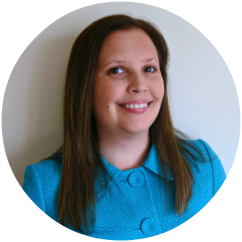 I am still struggle with trying to accomplish blogging goals and not sacrificing precious time with my children. Everyday I remind myself that my children are quickly growing up and I need to cherish moments with them. I always love watching my husband spend quality time with our children. LL loves spending time with her Daddy. 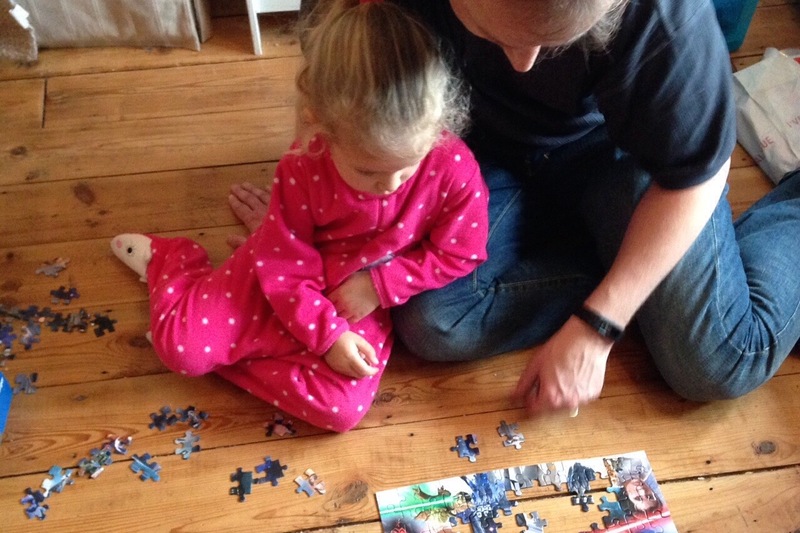 She gave a Star Wars puzzle to her Daddy for his birthday and she loved working on the puzzle while asking her Daddy about all the Star Wars character on the puzzle. It is always so special when we get to share our life experiences with our children including Star Wars Movie knowledge. We had lots of fun this Halloween. LL wanted to to be a pumpkin. I cut out a jack-o-lantern face from some black felt and glued onto an orange sweatshirt. Green pipe cleaners in her hair to look like pumpkin vines were a perfect addition. I also purchased padding to make her a round pumpkin but she preferred a flat pumpkin. BB was a Minion. His adorable hat was purchased from Pam Crafted UK from Etsy. With yellow shirt from Boden and his OshKosh B'Gosh overalls he was a perfect little Minion. We are looking forward to November and new adventures. We are heading to London to see Father Christmas at Harrods and Little LadyBug's Christmas List keeping growing. I am cherishing this last month before my sweet son turns 1 Years Old. I can not believe how fast time keeps moving by. What was your favourite moments this October?